I have been doing a lot of thinking about photography lately, and I wanted to share some of those thoughts with you and perhaps even get some feedback. I feel like much of the conversation about photography, especially when one is first starting out, is all about technique and settings. I know that was where I focused after upgrading to my DSLR camera. I wanted to know the exact settings for getting the kinds of pictures I was seeing and admiring, and I could not figure out why that information wasn't always readily available. It was not until much later that I started to realize that settings are only a small part of the picture. Not that they are not important, they are, but knowing how someone else took a picture does not always mean that I could then go take that same picture. Continuing that train of thought has led to me conclude that photography is really about three main things: timing, patience, and luck. The more time anyone spends with photography, the more they become interested in light. 'Painting with light' is a rough translation of the word photography to begin with, and the recording of light in a specific time and place for a specific interval and with specific settings is the mechanical heart of photography. But timing is what makes that heart beat. There is endless discussion of light in photography. About the types and directions of light. About the temperatures and colors of light. About the shadows, lines, and depths created by the movement and manipulation of light. Once you begin to understand about light, you also begin to realize that getting that light is all about timing. If you want to photograph during the "Golden Hour," then you need to be up and awake for that hour centered right around sunrise or out and about during that hour centered right around sunset. Professional travel and landscape photographers understand this. Timing and the planning behind it are critical to their work and their success. Photographers use tools like the Photographers' Ephemeris to plan out their shoots and to refine their timing. This program allows you to view and plot sunrise, sunset, moon rise, and moon set for any location and date. You can figure out exactly when and where you need to stand if you want to capture the full moon rising behind a significant landmark. These kinds of shots rarely occur through happenstance. They are the result of an intentional, creative decision on the part of a photographer who understood the critical role of timing. As a tourist or casual photographer, however, timing is not always something that we have at our disposal. We have other obligations, places to be, or group outings to meet up with. We have a whole family's worth of schedules to coordinate or friends to reconvene with. And so we come home with memory cards full of photographs taken in harsh noon light or sunsets hastily snapped before our evening event, and we wonder why our photographs fall short. We did not have the timing down. We did not plan for the light that would best flatter our subject. We took what we could in the time that we had, but it is often not the same. I had envisioned a grand, glorious sunset behind the Tetons. and not helped by clouds or dramatic light in any way. Something that I have learned from participating in the 365 Project and the routine of daily photography is that quality photography requires patience. Yes, I can take a picture every day in less than a minute, if I wanted, but that does not mean that it will be my best picture. It does not mean that I am learning and improving from the experience. Great photography is the result of a process that involves significant patience and waiting. Timing can get you to the right location at the right time, but it cannot prevent the clouds from blocking your full moon or the rain from wiping out your glorious sunrise. This is where patience is required: the patience to return to a location again and again; the patience to wait for the light or the weather to be 'just right' for what you had envisioned; the patience to keep exploring and taking images rather than just going with your first thought and stopping. I recently decided to alter my morning commute slightly and give myself around twenty minutes before work for photography. I wanted to pursue morning light, as the later autumn timings means that the sun is just rising when I leave for the day. In my first week, I saw the sun exactly once, on the first morning. And then, it was glorious: brightly burning through a mist of foggy frost and creating hazy silhouettes. The next four mornings, in contrast, were a string of cloud-laden skies and deep gray autumn skies. Had I only gone out for one time, one morning, it is unlikely that I would have captured the grand sunrise over the lake I had been picturing. Instead, I wanted to challenge myself to exercise patience, to continue to return to the same location, and to see what I would be able to find through such an exercise. Patience is also needed when trying to 'work the subject.' The idea here is that you want to devote some time and creative energy to deciding how best to photograph your subject. Do you always take landscape shots that are horizontal? Are all of your portraits shot from the same position or including the same amount of the body? Are all of your close-up flowers shots head-on with the flower in the center? Push yourself to try something different. Exercise patience and devote a little more time to getting the photograph that you want or creating one that you like even more than what you originally thought you wanted. Spend some time walking or moving around your subject. Change your perspective or your focal length. Get in close, back up far, get down low, or look down from up high. Be patient in deciding that you are 'done' photographing. You may surprise yourself. Even with the right timing, even with the patience to return for the shot or to think about it in a new way, there is still always an element of luck in photography as well. This element does not dismiss the great amount of skill and effort that goes into such a picture, however. Freeman Patterson said it well in his book, Photography and the Art of Seeing, which was our book club choice for last August. On page 85, he notes that "Critics who scorn the 'lucky' chance of a photographer are suggesting an accident takes place when a photographer captures a unique event that lasts only a moment, but it is no accident if the photographer anticipates the event and knows how to use his tools … A photographer has to hope for and prepare for 'lucky' chance." Photography is luck in that all the elements of the image have to come together at the right time and in the right place to be captured by the photographer. But it is the skills and knowledge of the photographer that allows them to successfully capture that 'lucky' image. Even studio photographers, with their ability to control the lighting and elements of the set down to a minute detail, still fall mercy to the importance of a hint of a smile in the eyes or a coldness in a stare that might vanish in a fraction of a second. Photography must always include an expectation of the unexpected, particularly when working with forces beyond our control, like nature, pets, or children. 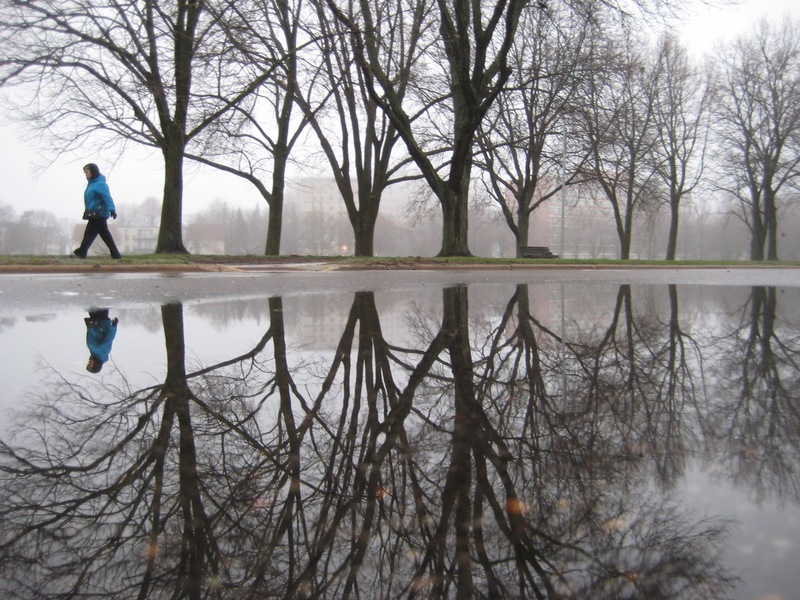 I loved the reflections of the trees in this puddle but felt like the image was incomplete. Agree or disagree? For me, the understanding that photography is timing, patience, and luck has helped me to refine and expand my process. I understand why my one day in a location does not measure up to the standards of an image created by a photographer with infinitely more hours and more experience shooting in that particular location. But I also understand how I can explore the importance of timing and can exercise more patience in my own photography. I can do the learning and the investigating and come away with dramatically improved images. And who knows? Maybe the next time a lucky chance comes around, I will be ready and prepared to capture it.